This card can only be Special Summoned by removing 3 Fiend-Type monsters in your Graveyard from play. When this card is destroyed in battle or by your opponent's card effect, it is treated as an Equip..
As long as this card remains face-up on the field, negate the effects of Effect Monsters destroyed by Fiend-Type monsters on your side of the field in Battle. This card cannot be Special Summoned from.. This monster can take on the ATK and DEF of 1 opponent's monster on the field (a face-down monster results in an ATK and DEF of 0). 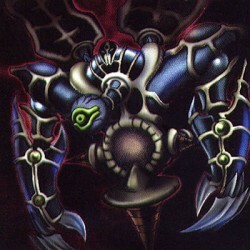 Treat the selected monster as an Equip Magic Card and use it to equi..
"Relinquished" + "Thousand-Eyes Idol" As long as this card remains face-up on the field, other monsters cannot change their positions or attack. This monster can take on the ATK and DEF of 1 opponent'..